Mohammed and Mustafa Hingora are the two that came up with the idea (and they actually happen to be fraternal twins). 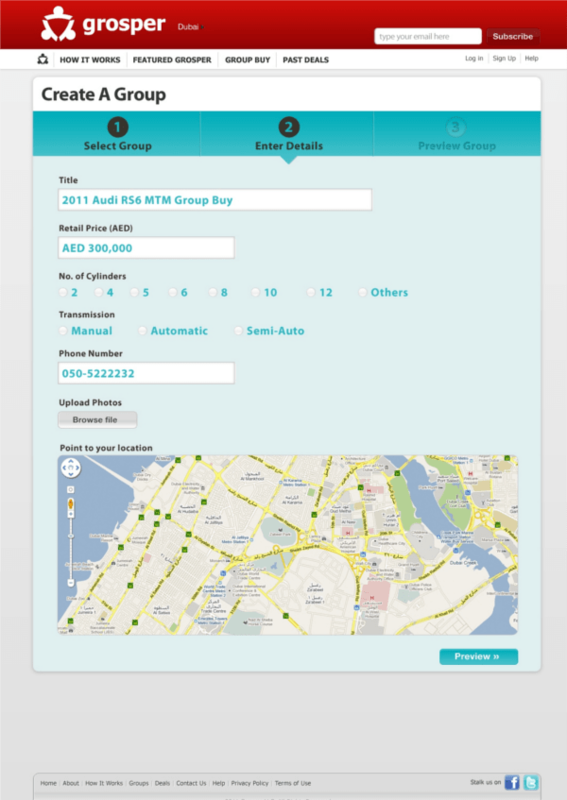 The reason they started Grosper is that they felt that customers in Dubai were very unhappy with the real estate situation and the small investors felt like they were being cheated, so with this platform all customers would be entitled to leverage the benefits of group buying in order to get better results, Mohammed mentioned that it doesn’t always have to be a better price, it could be negotiating power or knowledge power. 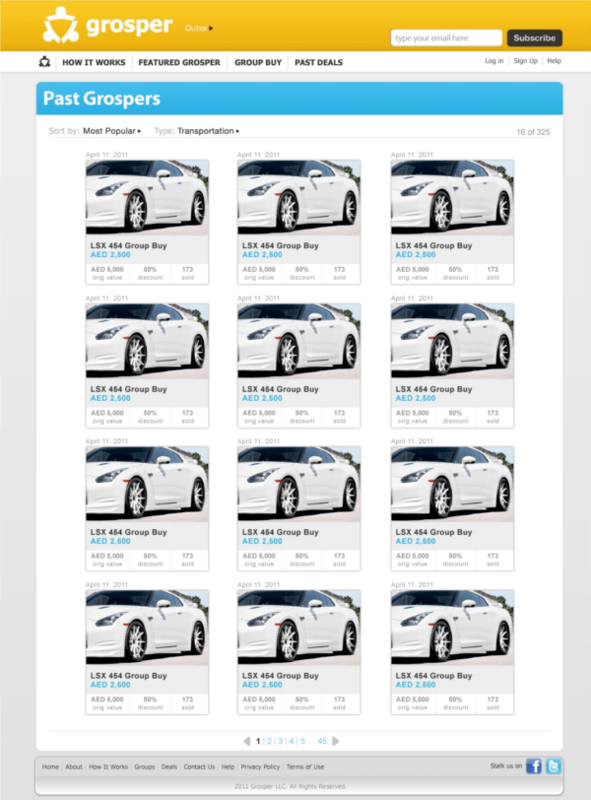 The whole concept is aggregating people to aggregate power. Mohammed then cited a report he had read earlier this year that between 30-35% of an average family household income goes into real estate while only 20-25% goes into the day to day consumer items. Users can also be warned or blacklisted from this section of the website. The website will initially focus on deals from Dubai, even the travel section will aim to push tourism inside the UAE, Mohammed called it stay-cations instead of vacations. 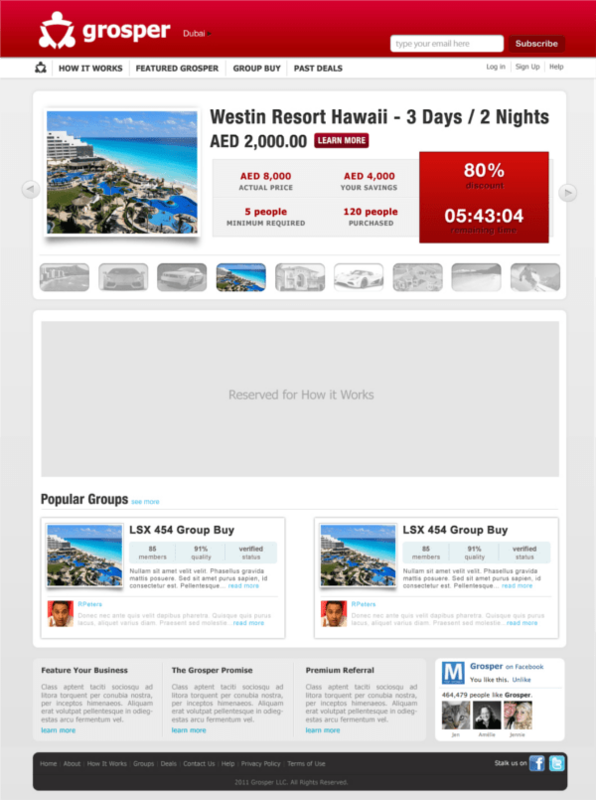 So they would practically have deals for hotels and resorts in Fujierah and RAK in the UAE. 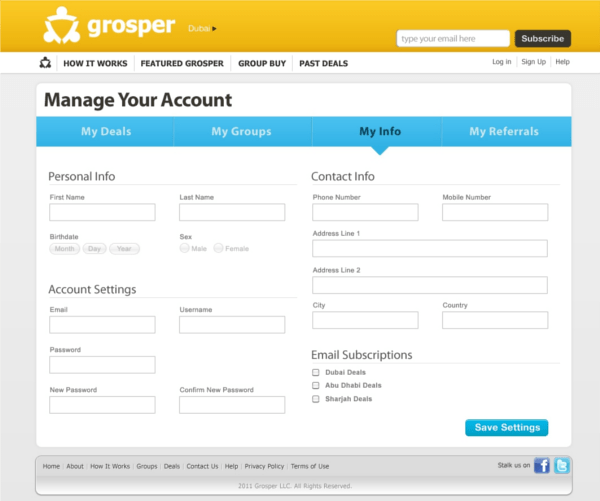 Grosper’s marketing will focus entirely on social networks especially on Twitter, they have already started a sweepstakes campaign where users can enter a chance to win an iPad 2 by referring three friends to register on to the site. Once the website is ready to go live sometime in July/August they will also have a number of videos that will help in educating people on how to use Grosper and raise awareness about the new platform, since Grosper is a social commerce platform they hope these videos will have a viral effect. In the future they plan to keep the users coming back with a loyalty program that is still being planned. Mohammed feels that they will have a very tough six months ahead just to educate users on how to use the personalized group deals, but he is confident with their phased approach to the development of the website they will manage to make it work because they will focus first and foremost on customer service and focus heavily on their feedback. Mohammed believes that customer service is something that is lacking in the region so he plans to do something about it with Grosper. So what does the future hold for Grosper if it does succeed? I asked Mohammed, he mentioned that he would definitely like to expand to the other emirates in the UAE, Bombay and quite possibly the rest of the MENA region. However he did mention something else that caught my attention which was that he would like to setup a Board of Directors with experienced people from the region in the industry in order to aid and provide assistance for his startup, however he was unable to do so yet. What do you think of Grosper? Do you think the idea will work in Dubai? Let us know your thoughts. I personally think this is a great initiative and am actually waiting for Grosper to launch and start coming out with the deals! 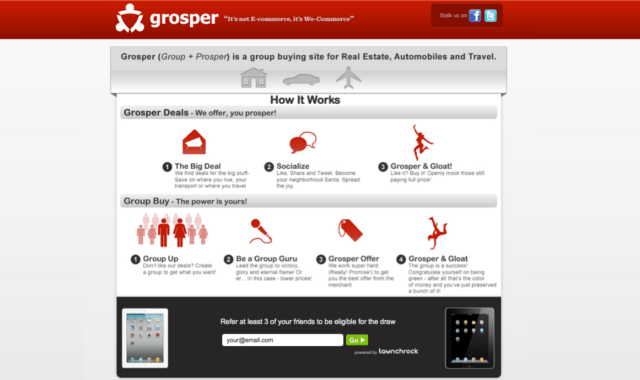 How far it would be successful would depend on the people of UAE and Grosper’s marketing.